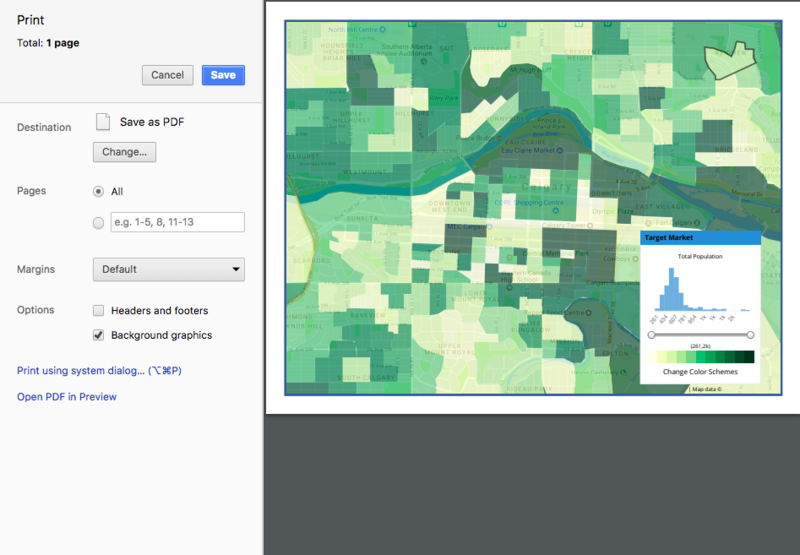 The Target Market panel just got a lot more powerful with coloring options, distribution charts, and more. When creating chloropleth maps to indicate an area's population, wealth, ethnicity, or other variables, you can now also indicate the actual values that are being represented on the map. 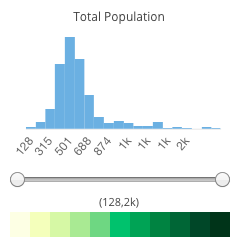 Now when you're creating a map, you can also indicate the Population statistics associated with a dark, or light green area, using the histogram shown in your Target Market legend. Absolute values can only be shown for heatmaps that are using one variable. For more information on showing multiple variables, see here. In addition to seeing the absolute ranges of your population distribution, you can also choose to only show a certain range in the heatmap. The heatmap color has traditionally been shown as a green color scheme, going from light yellow green, to a dark green color. You can now choose between four different color schemes depending on how you want to display the data. Still have questions? Don't hesitate to reach out to your Customer Success Manager in the Chat, or email support@piinpoint.com for help.